You have crossed Rs 1,000 crore-mark in annual revenues, recently, you have seen many firsts in your career. How has your journey been from 1995 to 2018? 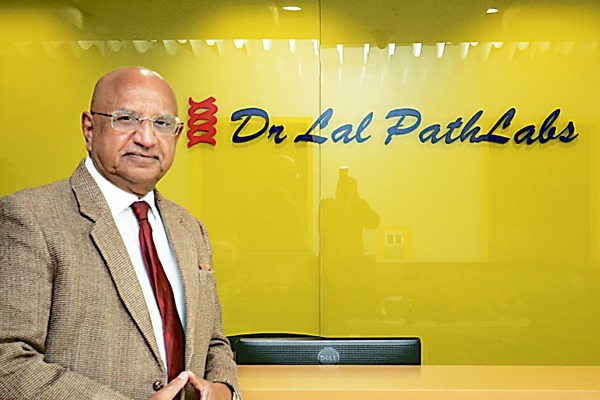 Dr Lal Path Labs is 70-years-old. It was started by my late father Dr SK Lal, a retired army major, in 1949. He was a pioneer in his days and introduced many new tests in India for the first time. He passed away in 1977 after which I had to take over the lab. I was a doctor doing post graduation in Pathology, teaching undergraduates and the warden in the hostel in Armed Force Medical College (AFMC), Pune. After I took over the lab, however, there was no looking back. Since then, I have introduced many initiatives in the diagnostic industry. For example, the HDL test for Cholesterol, which is part of lipid profile now and the first thyroid test in a private lab, was introduced by me. Not just that, but the first computer for the healthcare segment was brought in by me in 1986 as part of lab information management system (LIMS). Another milestone in the life of laboratory medicine in India is the franchise model or collection centres, which Dr Lal PathLabs has created. This has evolved to its maturity and is now the famous ‘hub and spoke’ model for collection centres, satellite labs and reference labs. The lab was earlier known as Central Clinical Laboratory, which was coined by my father and I changed it to Dr Lal PathLabs Pvt Ltd in 1995. Since then, the brand has played a major role in the diagnostic industry by creating standard operating procedures for each segment of its operations right from the labs to collection centres. Your thoughts on illegal/unorganised path labs and the patchy implementation of Clinical Establishment Act? There are over 1,00,000 pathology labs in India but majority of them are mere testing shops. Only 1,038 out of 1,00,000 labs are accredited by the National Accreditation Board for Testing & Calibration Laboratories (NABL), with hardly any government sector lab being accredited. I am happy to share with you that 32 of our labs are NABL accredited and another four in the pipeline. Thus you can see that there are very few quality labs in India. Ideally, as in developed countries, ALL labs should be accredited by the national body. In India, the first step should be to have a very strict regulation on the running of a lab as enshrined in the Clinical Establishment Act. This specifies clearly who can run a lab and the other basic requirement needed in running a lab. In most cases in India, labs are run by individuals who are not pathologists. How has the role of pathologist evolved in our country? Do you think the treatment in India is increasingly based on pathology findings than merely treating symptoms using antibiotics? The importance of laboratory testing is increasing day by day. Modern medicine is evidence based medicine and 70 per cent of all clinical decisions are taken based on pathology tests. A patient’s stay in hospital can be cut down to the bare minimum if you have a good pathology back up in that hospital. This reduces the cost of treatment also. For example, a patient reporting with chest pain can be due to many reasons that include indigestion, muscular pain, heart attack etc. A pathology test known as Troponin – I detects hundred percent of all heart attacks, whereas the ECG can miss detecting 35 per cent of the heart attacks — that is where lab medicine has advanced to. 65 per cent of our population dies of non-communicable diseases such as diabetes, high BP, cardiac disease, cancer etc. At the same time, we have 35 per cent dual burden of communicable disease led by tuberculosis that affects 2.8 million people and on an average, one person dying every one minute due to this disease. Apart from it, we have additionally vector-borne diseases- malaria, dengue, chikunguniya etc. In order to control all of these, we have to diagnose them correctly and that is where the pathology lab plays a crucial role. What is your opinion on Health and Wealth Centres (HWC) and Ayushman Bharat? With six lakh villages and 1,50,000 HWCs proposed by the government on an average, there will be one centre covering four villages. Each of these centres should comprise of pathology labs with good quality standards. These labs will play a crucial part in the patients primary healthcare. As already mentioned, we have 1,038 accredited labs pan-India, that can be roped in, instead of blindly selecting an unaccredited local lab on the basis of having offered the lowest rate – L1. The government is yet to unfold its HWC scheme, and we hope there will be a healthy dialogue by the central and state governments with the diagnostic industry before it gets implemented. As for Ayushman Bharat, AB – PMJAY, it is too soon to start celebrating its success but we are quite optimistic about it. There are however certain grey areas in the scheme, which we have pointed out to the government. One of them is the rate they are offering that is unrealistically low for the good private players to accept. We hope these are considered and sorted out. If we want India to be the third biggest economic power by 2050, then we will have to address the question of realistic healthcare costs that should be paid to the providers. This is especially true when the private sector looks after more than 70% of India’s population. The central government is considering price caps on diagnostic tests. Do you support it? The World Health Organisation (WHO) has come out with a significant first-ever Essential Diagnostics List (EDL) and it has been given to the Indian Council of Medical Research (ICMR) for implementation. ICMR has now circulated this list to the healthcare providers. Once the question of pricing comes about, I am sure that the government will consult the private sector before jumping to freeze them. What are the latest cutting technologies adopted by Dr Lal PathLabs? Latest technologies in Biochemistry, Microbiology, Molecular Diagnostics, Genetics that include Next Gen Sequencing (NGS) have been introduced. We are the first private lab in the whole of South Asia to possess an Electron Microscope to diagnose Kidney and other diseases. In another first, CSIR- Institute of Genomics & Integrative Biology (IGIB), as a part of technology transfer, has transferred to Dr Lal PathLabs 27 latest tests in Genomics to diagnose rare diseases in the field of neurology, hematology and cancer. You last increased prices in 2016, but how cost-effective are your tests or packages and how do you balance quality and affordable price? We have increased very minimally the price of pathology tests. It is much below the inflation rate – the price rise has been averaging a miniscule less than 1.5% per year against an average inflation rise of 5% -10%. One must realize that the rupee has devalued greatly in the last ten years and subsequently the import duty has gone up even in life threatening tests for tuberculosis, diabetes, high blood pressure and cancer. Also, the salaries have gone up along with the cost of rental properties and logistics. We have endeavoured to constantly innovate in bringing best quality standards and making sure not to make the tests unaffordable for the common man. Going forward, what is your vision for the diagnostics industry? Quality and accredited diagnostic lab like ours have been able to reach only 30 per cent of the population. The rest 70 per cent are in tier II, tier III cities and rural villages are still to be reached by quality lab services. Thus it is obvious that the private sector cannot be neglected in our quest for quality healthcare services. By actively collaborating with the private diagnostic sector, the government can actually fulfill its dream of Arogya Bharat. If our help is taken judiciously the entire sector can see a sea change. We can be of great assistance in the control of Non Communicable Diseases (NCDs), as our not controlling them in the next 10 years will lower our GDP by two per cent. Therefore, the diagnostics industry will play a pivotal part in making India healthy and prosperous.